What Is Your Christmas Wish This Holiday Season? 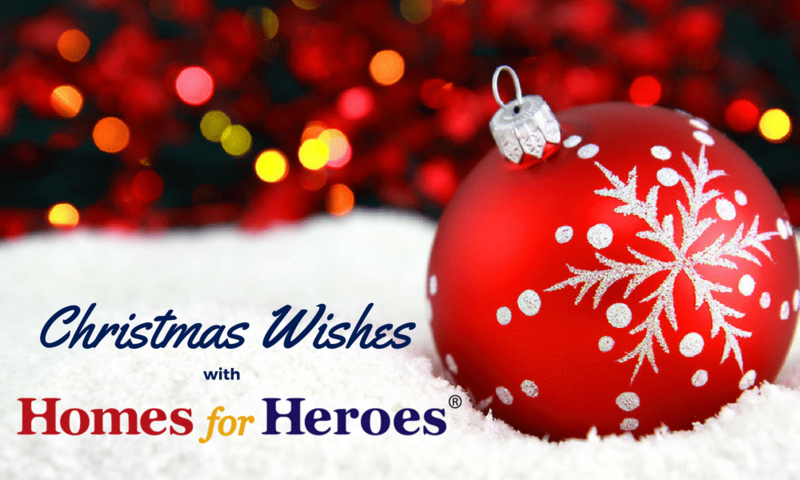 To celebrate Christmas and the Holiday Season, we thought it was only fitting that we, the people behind Homes for Heroes®, share what our Christmas Wishes are for this year. But, before we get to what our wishes are, we would like to thank our nation’s every day heroes. You are appreciated more than you know and without you, some of our wishes wouldn’t be possible! Abby, National Director- ”With all the stuff going on in the world, all the busy to-do’s we fill our lives with and the laundry list of things we want, my wish for this holiday season is that everyone can take a minute to slow down and truly enjoy what’s really important to them. “Recently, I can’t help but notice all the stories I hear and see that put things into perspective. Whether it’s one of our affiliates that just underwent surgery for a sudden brain tumor or one of the many stories from our 12 Days of Christmas Miracles; such as a single mom working the night shift as a correctional officer just to survive and provide for her children, or a firefighter who has taken on the care of two little girls to help provide for them and give them a chance at a better life and let us not forget all of our military members serving overseas and not afforded the opportunity to be with their families during this time because they are protecting our freedom. It makes some of my own worries or troubles seem inconsequential and makes me appreciate all the amazing blessings my life is filled with. My family, my friends, my home, my health and a career that fulfills me because it’s purposeful and is my passion. Kim, Bookkeeper- “My 1st Wish is: I hope each person will go out of their way to help someone else. What a wonderful thing that would be if all 8 million people did a good deed! “My 2nd wish is: Every child would know the love in their own lives that my kids enjoy every day. “My 3rd wish is: That hunger disappears. “I could make a million more, but these three are terrific ways to start.